We’d love your help. 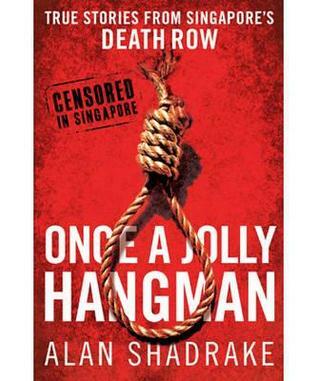 Let us know what’s wrong with this preview of Once A Jolly Hangman by Alan Shadrake. To ask other readers questions about Once A Jolly Hangman, please sign up. Reading this book is just like reading some gossip magazines. Alan presumes, thinks and assumes quite a bit in this book. Towards this end of this book, I could even feel he got so carried away in his own self-created thoughts. He has quite a lot of 'someone from somewhere told me reliable information about this and that' which is more to me like 'A little birdie told me this and that'. Still, I find it rather silly to have this author arrested over a book. The author is a self-promoting sensationalist who calls himself an investigative journalist. He keeps repeating himself and the publishers have apparently not edited this collection of article drafts. It's an easy read. Somewhat entertaining, but very frustrating if you are looking for a trustworthy and well-written source of the history of Singapore's death penalty. The contents of this well-researched book were so depraved and disturbing, that it took me several weeks to (1) finish reading the book in its entirety, and (2) gather my thoughts about it in order to write a cohesive review. I would have thought that the book was a work of fiction were it not for the ‘non-fiction’ label at the back of the book in the print version. Back in 2013, former ISD director Mr. Yoong Siew Wah mentioned “the callousness of the Singapore government” on his blog. This callous The contents of this well-researched book were so depraved and disturbing, that it took me several weeks to (1) finish reading the book in its entirety, and (2) gather my thoughts about it in order to write a cohesive review. This callous and insensitive aspect that is completely lacking in any compassion for humanity, is certainly apparent in Once A Jolly Hangman. The title alone points to the bizarre nature of the system, where the macabre act of hanging a human being is undertaken with joy as if it were a festive occasion and cause for celebration. Is this not a form of ultimate exploitation of human life, where one profits handsomely from the dead and forgotten? The other thoroughly disgusting component of the book has to do with the racial bias of the elites. The author, Alan Shadrake, structures the book around several real-life accounts to show how people with money and the right connections have the means to prevent themselves from being executed by the state. If you’re poor, uneducated, or of an undesirable race (or, to phrase it a little better, your skin colour is not the right one), yours is the “pitiful, hopeless situation” where even the innocent may end up being executed. Alan Shadrake went to jail because of this book — for contempt by scandalising the court. A scandal can be defined as an action or event regarded as morally or legally wrong and causing general public outrage. How is the author scandalising the court when his book is based on scandalous facts? What Alan Shadrake did with this book was to give the deceased a human face, since their lives weren’t worth anything to the Singapore authorities (apart from what could be gained from their organs, post-mortem). This further highlights the hypocrisy of Changi Prison’s motto. Renew? Restart? Tell that to the families of Flor Contemplacion, Angel Mou Pui-Peng, Amara Tochi, Shanmugam Murugesu (a Tamil Singaporean former jet ski champion and army regular), Nguyen Van Tuong, Vignes Mourthi, and countless others who were executed in Singapore for being at the wrong place at the wrong time, without the riches or powerful connections to help them out of their dire situation. Or to the family members of Huizuan with regard to her tragic death in Changi Women’s Prison in 2011, which could have been avoided if more care had been shown by the prison staff in her medical condition before her death. What is even worse is that Changi Prison sends out a letter to the families of the individual on death row informing them of when the execution will take place — a letter which has that same motto emblazoned on the bottom of the page. As for others, one mans democracy is another ternary. This section includes all non-symbolic monarchies. In many, there are no elections of any kind. In others, there is elected legislative input, but substantial executive and/or judicial power resides in a hereditary leader or very small hereditarily determined oligarchy. Theocracies… the only one that comes to mind is IRAN. Sad to see that the exposure of Singapore's death penalty practices received such short attention from Shadrake. Repetitive, pedantic, and horribly edited. The book has an interesting premise, that the Singaporean judicial system considers a number of factors (such as national origin or wealth) in determining punishment. This thesis, however, is undermined with poor writing and arguments. There is also a focus on how the hangman works in Singapore, as the author received access to him. Took me 2 years to find a copy of this book because it is banned in my country. I have read it 3 times and it has been interesting every time. Also spoken to the author and he has enlightened me in more way then one. Once a Jolly Hangman is a book that you can no longer find on any bookstore in Singapore. I had to pick up my personal copy across the border in Malaysia. The book isn't officially banned but bookstores across the island seem to have played it safe, less they incur the wrath of the powers that be. The temptation to pick up the book heightened towards the end of the trial brought against its British author Alan Shadrake in 2010. The former journalist was arrested and charged for contempt of court Once a Jolly Hangman is a book that you can no longer find on any bookstore in Singapore. I had to pick up my personal copy across the border in Malaysia. The book isn't officially banned but bookstores across the island seem to have played it safe, less they incur the wrath of the powers that be. The temptation to pick up the book heightened towards the end of the trial brought against its British author Alan Shadrake in 2010. The former journalist was arrested and charged for contempt of court and subsequently jailed for 6 weeks despite an international outcry. But I decided to let the dust settle so that the book may be read with a clearer head. I only picked up this book towards the end of 2011. The work primarily revolves around an interview that the author did with Singapore's chief executioner, Darshan Singh. He is widely thought to be the most prolific hangman in recent times, having sent no less than 850 people to their death in a dubiously illustrious career of 43 years. The death penalty is still very much a controversial topic in Singapore whose population is cleanly divided between those who oppose and those who call for its repeal. But regardless of what your position is on judicial executions, my suspicion is that you will be sickened to the gut when you read about the case of Vignes Mourthi, a Malaysian who, as the trial judge himself admitted, could possibly be innocent but sent to the gallows anyway due to an statutory obligation. Or the case of a young aspiring footballer Tochi, who was sent to his death anyway despite the lack of evidence to show that he knew what he was carrying. Read it and then make your own judgment on the death penalty in Singapore. I'm hoping to get my hands on this book soon. As most of us know, the author of this book is currently in jail in Singapore over some controversial information written in the book. Hence, though this book is not officially banned in major bookstores in Singapore, most retailers have lifted it off the shelves as a precaution. I am really looking to get a deeper insight into the author's views of the Singapore Justice System. With a profound knowledge in the system, one can better understand the c I'm hoping to get my hands on this book soon. As most of us know, the author of this book is currently in jail in Singapore over some controversial information written in the book. With a profound knowledge in the system, one can better understand the case - arguably whether the death penalty should be abolished in Singapore. The death penalty in Singapore has caused much controversy among many netizens and foreigners alike. I remember the trial of Van Tuong Nguyen, an Australian national who was convicted of drug trafficking in Singapore. The case had been such an uproar such that even the Australian-Singapore relations had suffered badly. I really hope this will be a good book. Found this book in a used-book sale and got it when my friend told me it was banned I mean, strictly unsold in Singapore bookstores. Once I got started it was hard to put down, as this book is a treasure trove of information that the Singapore government would rather you not know. One important thing to note is that Shadrake is not a lawyer or an academic. He is an investigative journalist by trade, and thus this book tends to skim deep analysis in favour of rhetorical devices and interviews. A Found this book in a used-book sale and got it when my friend told me it was banned I mean, strictly unsold in Singapore bookstores. Once I got started it was hard to put down, as this book is a treasure trove of information that the Singapore government would rather you not know. One important thing to note is that Shadrake is not a lawyer or an academic. He is an investigative journalist by trade, and thus this book tends to skim deep analysis in favour of rhetorical devices and interviews. Also, I'm not sure if the edition I got was pirated, but there were quite a few grammar and syntax errors that drove me mad. However, the intriguing evidence he provided made up for that. A compelling read. I suspect Alan's repetition serves readers who can stop and start throughout the book. Research is obvious though I would have liked references as much as possible. As for the content, it is entirely reasonable to expect, and as Shadrake has uncovered, what's up with the State, the former colony. As the rest of the world has moved on, matured and become more civilized, it's important that these misgivings enter the public discourse and are read as far and wide as possible maki A compelling read. I suspect Alan's repetition serves readers who can stop and start throughout the book. Research is obvious though I would have liked references as much as possible. As for the content, it is entirely reasonable to expect, and as Shadrake has uncovered, what's up with the State, the former colony. As the rest of the world has moved on, matured and become more civilized, it's important that these misgivings enter the public discourse and are read as far and wide as possible making change all the more compelling. This is disgusting journalism - speculative, sensational, weakly substantiated. The only merit this book has (I'm still irritated I have to give this 1 star instead of half) is its compilation - not even of facts, but of hearsay and gossip. The book does raise some interesting questions, but in a manner so crudely and clumsily that it is more a turnoff than intriguing. This sums it up: "Mr Shadrake once again displays a tendency to distort his own sources for his own purposes," as per AG v Shadr This is disgusting journalism - speculative, sensational, weakly substantiated. The only merit this book has (I'm still irritated I have to give this 1 star instead of half) is its compilation - not even of facts, but of hearsay and gossip. The book does raise some interesting questions, but in a manner so crudely and clumsily that it is more a turnoff than intriguing. Deeply disturbing how they hang people and the reasons behind why they won't stop the practice. It certainly should make anyone ever considering using drugs in Singapore think twice. The interview with the Jolly Hangman was eye opening I don't fully understand how one person can do that job and take so many lives and yet remain so positive about life in general, the whole book astounded me and has certainly made me view alot of things in a very different light. And to those still fighting that long Deeply disturbing how they hang people and the reasons behind why they won't stop the practice. A fascinating insight into the policies of capital punishment in Singapore and the governments own adherence (or sometimes lack of) to their mantras. A necessary read for anything with an interest in Singapore. Excellently researched and I commend the bravery of the author who was arrested, questioned and charged over this book. Excellent Book. This book offers a valuable insight to one of the system that was never published in the daily papers and not known to the public. An eye-opener indeed. I love the part on the exclusive interview with Mr.Darshan Singh. I have yet to see any book or author digging deep into the unknown. Good read! An interesting examination of capital punishment in Singapore, a country where execution can be ordered for crimes that we in Australia might consider relatively minor. Interesting reading for human rights activists, expats, Singaporeans, and travellers to this fascinating city-state. A good reminder to those who live, work or travel to Singapore that beneath all the modern glitz and glamour there lurks a justice system from a past era that has devasting consequences for those who stray to the wrong path. Shadrake's controversial book is well-researched, well-presented and chilling to the core. It does not matter what your stand on capital punishment is, but the reality behind the glossy exterior of success in this city state is what matter most. Very interesting perspective on Singapore and Capital punishment. Makes you think. investigative journalists look at 'justice' in singapore, includes caes of australian vietnamese Van Nguyen Toung r.i.p. Alan Shadrake is a British author and former journalist.